Livemont started out as an interior designer in his home town of Schaerbeek, Belgium. He came to poster art after entering a poster contest on a whim and winning it. By 1898, The Poster magazine was calling him "the uncontested master of Belgian posterists." Though one of several posterists often assumed to be disciples of Mucha, Livemont's version of Art Nouveau was in fact well-developed before Mucha burst onto the scene in the 1890s. In this poster, Absinthe, "The Green Fairy," is celebrated in this very famous Belgian poster. Made from wormwood, Absinthe was an addictive, ultimately poisonous, hallucinogen much beloved and maligned in the Belle Epoque. Wildly intoxicating at 144 proof, Absinthe was normally mixed with water that was filtered through a sugar cube which turned the clear liquor to an emerald green. 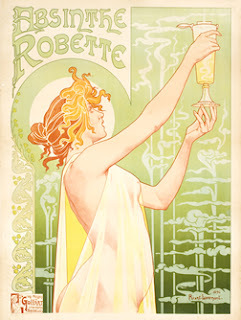 Habitués, such as Toulouse-Lautrec often would progress toward drinking it almost straight. This dreamy image by Livemont captures the essence of the absinthe subculture. The maiden appears in a mystical trance as she holds the glass aloft. The pale, emerald tones and patterns of the background are classics of Art Nouveau finery. Often referred to as the "Belgian Mucha" for his idealized young beauties and rich organic settings, Livemont created more than forty posters before turning to painting early in the 20th century.